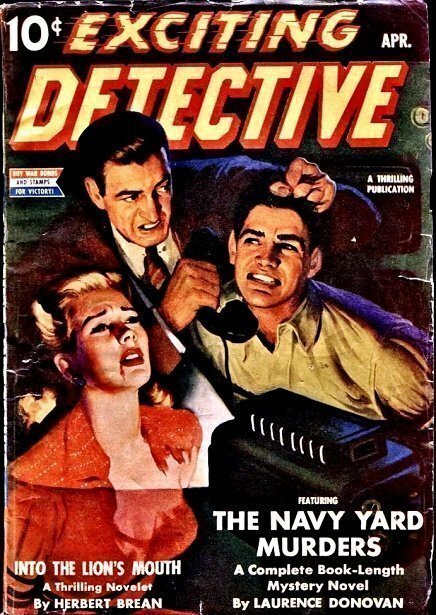 These are some of the premiere collectibles in pulps, with lurid and colorful action covers, including good girl, bad girl, and plenty of blood, violence and torture. Minor chipping and edgewear and spine bumping, plus some light soiling. A bit of paper loss at the upper right corner, plus tape repairs to the spine, which has been partially restored. The top and bottom ends have been replaced. Otherwise it’s intact and pretty bright and tight. By and large, the spine is amazingly bright and complete. “I am no expert but I would say this book is in Fair Condition. This book is very old and shows its age. The cover has chips and creases around the edges. 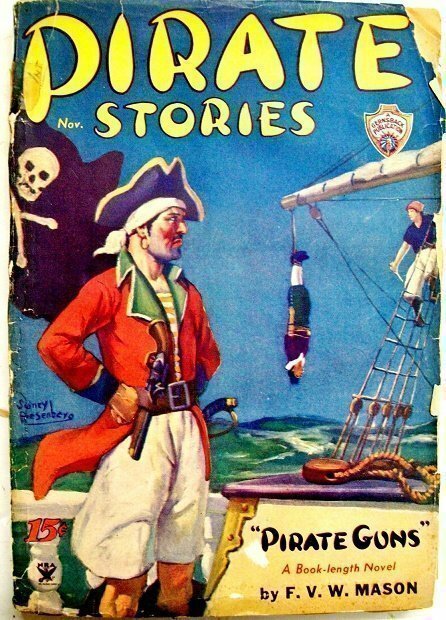 “this short-lived Hugo Gernsback pulp experiment, complete with a “yellow peril” cover (by Ray Wardel) and a piece on Jean Lafitte. 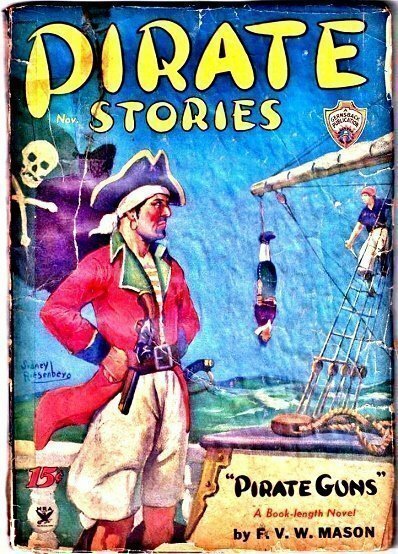 As I’ve said before, any pulp collection without an issue of Pirate Stories is only fit for soaking up bilge water. Condition: Front cover: Light edge wear, small overhang piece nibbled away (right edge, next to the “15”), a few stress marks, a couple of reading creases, light soiling. Back cover: A little nicer than the front cover. Spine: Complete, very slightly faded, very light overall wear. Hello All. This week I am liquidating my entire men’s magazine collection. Not holding anything back… All are complete unless otherwise notated in the condition description. above. …Also I will attempt to assign a grade but with these magazines I find them hard to grade. 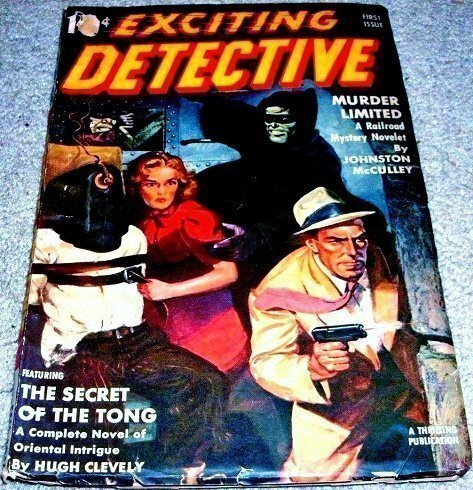 This cover has everything going for it: Man in Electric Chair with black hood over his face; Red dressed babe trying to unstrap him as another guy blast away with his gun protecting them; a Black Robed, Masked, Pale faced fiend climbing down rungs in the wall grabbing the babe, and still another snarling fiend behind an iron door preparing to pull the level. “Handling indicators, including light hairlines; front and back covers firmly attached. Brushed discoloration visible upon the light areas of the covers. Binding fully readable; paper supple; cover retains some gloss. Slight spinal edge staining, minor edge nicking, and a rub through at the upper left cover price area. Wax pencil distribution marking upon the back cover. Authors: “Yellow Death” (1ST “Unofficial Jones” appearance of 4) by Lee Fredericks (who also wrote the 22 “Mr. 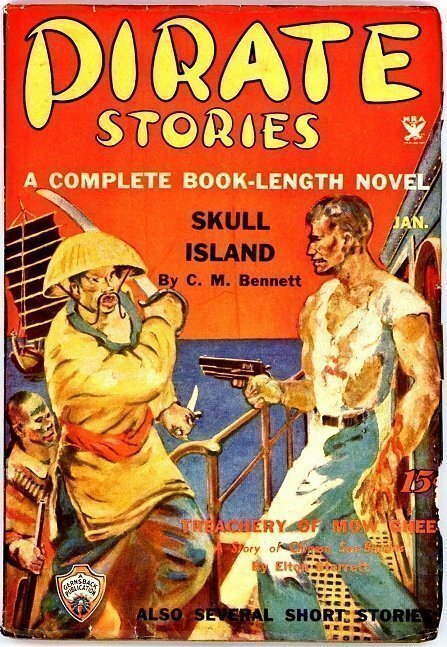 Richard Wong” stores in G-MEN (DETECTIVE) 1935-1946; Nelson S. Bond; Fredric Brown. “Front cover has owners name stamp under title bar (Perley Wicks), small pieces missing along right edge, heavy edge wear along the bottom with a piece missing and multiple short nicks, tears and folds. Spine is slanted with a ½” missing at the bottom. Back cover has store stamp and moisture stains (which do not affect interior pages). “The Thing in the Marsh” by Ray Cummings. 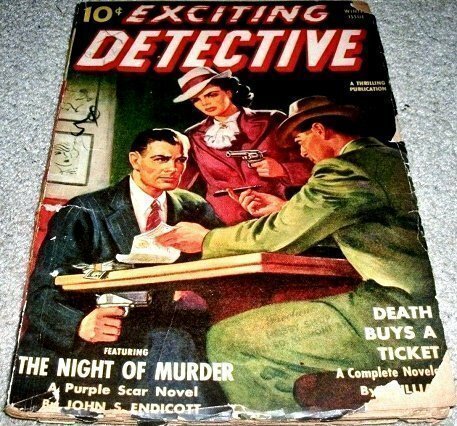 …containing a complete Purple Scar novel entitled THE NIGHT OF MURDER by John S. Endicott, detailing how the Purple Scar follows a ghastly pattern of slaughter to find the key to justice when death directs a grim scenario and a killer stalks a motion picture studio…. With that said, this issue is in average (-) condition… complete interior text. Supple paper, cover retains some gloss, edge binding completely readable, some edge and corner bumps/edge wear and bottom right front cover tear; some edge chips/nicks. Some brush discoloration noted upon the back cover. Some pencil writing on the logo “D” and a wa pencil price notation. With that said, this issue is in average (-) condition… complete interior text. No writing, supple paper, cover retains some gloss, edge binding mostly readable (upper and lower fractional spinal nicks), some edge and corner bumps/edge wear; some edge chips/nicks, although the paper is supple. 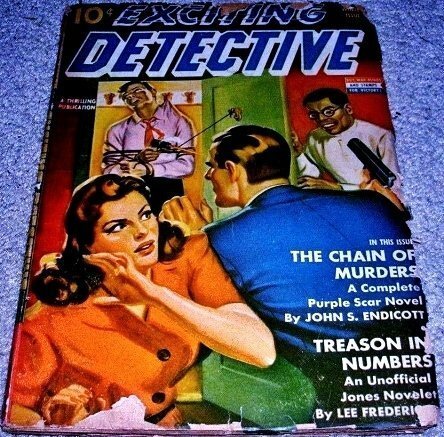 This is really a brutal cover with some guy, who appears deceased, strung up in a back closet in some kind of Oriental (1900’s – 1940’s “Yellow Peril” era) knotting and fixed so that he shoots however opens the door that he contained in. The stereotypical round glasses, big toothed, white shirted Oriental (‘Emperor Hirohito/PM Hideki Tojo’-type ) chap is doing the nicety of opening said door so the corpse (? ), who was probably either a friend or fellow agent/detective, can shoot our hero. other than the basement or attic.